We are responsible for caring for our bodies as they are outward indicators of our commitment to our Creator God and to a Christian discipline and lifestyle. With good health we have more energy, vitality, zest, and are attractive to other people who want that in their lives as well. Moreover, our bodies are holy and sanctified, a place for the Holy Spirit to live. An optimum diet of fresh and living foods is what nourishes us best and sustains our good health, energy and strong immune systems. "Do you not know that your body is a temple of the Holy Spirit, who is in you, whom you have received from God? You are not your own; 20 you were bought at a price. Therefore honor God with your body," (1 Cor. 6:19-20). Rev. George Malkmus, founder of the Hallelujah Diet, did not think that illness is "God's Will" and looked for answers to the question of why Christians get sick. 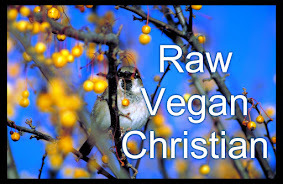 He looked to the Bible for health guidance and found a prescription for a what we now call a "high raw" vegan diet. He believes that violation of God's laws for health are what create sickness. He points out the following potential ramifications for Christians if they were to apply the health teachings of the Bible, as explored in his book Why Christians Get Sick, page 134. 1. Missionaries, pastors, evangelists and their families would not be forced to leave their fields of ministry due to sickness...or have their ministries ended prematurely by death! 2. Expensive doctor, hospital, and drug bills would be eliminated! In fact, the only need for doctors would be to repair broken bodies caused by accidents! 3. Hospital visitation would practically become a thing of the past as there would be no sickness! Funerals would only take place when the elderly died from old age, or as a result of accidents! 4. Eventually even nursing homes would become almost unnecessary, as the elderly would remain active, alert, and able to take care of themselves almost until death! 5. Through the teaching of proper nutrition and lifestyle from the pulpits and through missionary outreach, world hunger could be overcome!